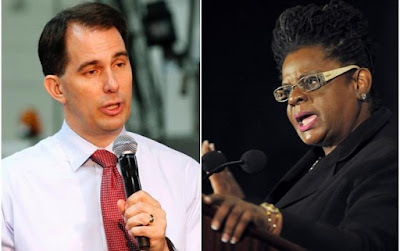 [SOURCE] Democratic U.S. Rep. Gwen Moore says that Republican Gov. Scott Walker's policies are "tightening the noose, literally, around African-Americans." Moore made the comment during a conference call Monday to discuss Walker's campaigning for president in South Carolina. Moore is black and represents Milwaukee in Congress. She says Walker's opposition to raising the minimum wage, requiring voters to show photo identification at the polls, and requiring drug testing for public aid recipients disproportionately hurt African-Americans. Moore also said Walker's rejection of a high-speed train line between Milwaukee and Madison took away jobs from inner city Milwaukee. She calls Walker a "stereotypical politician" who will say anything to get elected. Walker's campaign spokeswoman AshLee Strong had no comment.